..Labour would seek a final deal that gives full access to European markets and maintains the benefits of the single market and the customs union..
..We have long argued that a customs union is a viable option for the final deal. So Labour would seek to negotiate a new comprehensive UK-EU customs union to ensure that there are no tariffs with Europe and to help avoid any need for a hard border in Northern Ireland. So, to be clear, Labour’s understanding of ‘Take Back Control’ is to bind UK economic policy to the EU (ie., no new bilateral trade deals with the US or China or Commonwealth nations), and to agree a new customs union which negates the need for national borders. 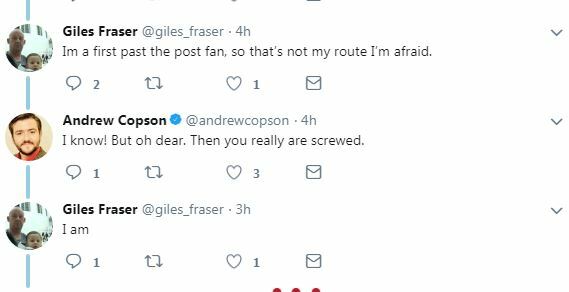 If dyed-in-the-wool socialists like Giles Fraser are struggling to support Corbyn with his new bespoke customs union, the Labour Party has a slight problem (as Frank Field MP has warned). Oh, the CBI and IOD are happy, and so is Lord Adonis, and so, no doubt, are Tony Blair, Ken Clarke and Anna Soubry (not to mention 99 CofE bishops [God bless +Mark Rylands]). But inveterate Labour Brexiteers smell a rat, a ruddy great rattus norvegicus laden with the plague virus, for a customs union with the EU effectively keeps us in the EU, impotent to exercise the economic sovereignty we voted to restore. Watch, next, as Labour argue for remaining a member of the Single Market, and thereby nullify every pledge they make to re-nationalise private industries (rail/mail/utilities) or offer state aid to protect jobs. The Customs Union permits free trade between EU members, but maintains barriers to imports from non-members. And so would Corbyn’s new customs union. Customs unions are a protectionist racket, creating artificial incentives for members to buy from one another rather than look further afield (to Africa, for example). Those Remainers who harp on (and on) about how “44% of our exports are to EU countries and 50% of our imports come from the EU” appear not to grasp that this is precisely because of the trade distortions caused by the Customs Union: the concentration of trade between members is purposely engineered to protect the wealth of members. If the UK had forged a customs union with the US in 1973, British trade would have been biased toward the US. If we had entered one with the Commonwealth, our trade figures would reflect that bias. It’s really basic economics. The EU’s commitment to its member states means it can be a bad neighbour to outsiders. Its actions impact adversely on poorer countries through various trade policies, most notably the Common Agricultural Policy (CAP). The EU’s export subsidies for EU agricultural products have disastrous consequences on food security and undercut agricultural sectors in the poorest nations. CAP is bad news for Africa. Jesus teaches us that our neighbour is not just our next door neighbour but everyone. Leaving the EU does not mean shunning Europe. We are Europeans and we will still have strong relationships with EU nations. Being able to make our own trade agreements, however, gives us opportunity to be more globally linked. The EU does not seem to be good news for the poorest nations in the Eurozone. Countries in the single currency, struggling economically, appear stuck with low growth. Unable to devalue their currency, they are trapped in a rut of depression. Youth unemployment in Spain, Greece and Italy has soared and extremist political groups are gaining a strong foothold. The UK has a proud history of welcoming migrants and has benefitted from the presence and contribution migrants make to society. Unrestricted EU immigration, however, means that we end up discriminating against non-EU nationals. This seems especially perverse when the UK has strong relationships with many other countries of the world through the Commonwealth, not just with the EU. The barriers to employing people from overseas, beyond the EU, have become more numerous. For a Church in the UK that is weak in mission, it would be particularly welcome to have greater freedom to invite missionaries from the global south to help us evangelise our country and rediscover our Christian roots. Unrestricted EU immigration has been adversely affecting the poorest people in the UK. It may seem great if you want to employ a plumber, a nanny or a builder but to those competing with immigrants for jobs, houses or places at schools, it looks very different. Corbyn’s customs union would put up barriers against cheaper imports of food, clothing and footwear, hitting the poorest of society hardest. 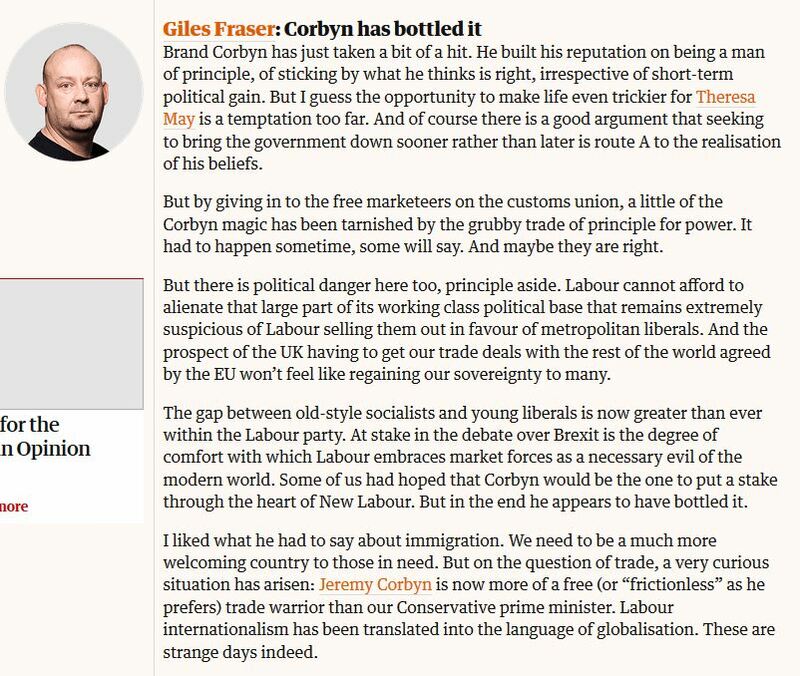 Corbyn’s customs union would prevent the UK from doing trade deals with impoverished African farmers while ensuring that we continue to import from the abundance of fattened French farmers and the siesta-loving Spanish, shielded from all external competition. 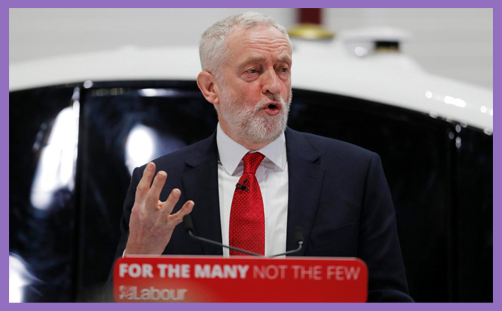 Cobyn’s customs union would nullify economic sovereignty by abolishing national customs and tax regimes. It would protect the wealthiest and most powerful industries against foreign competition by the imposition of tariffs. 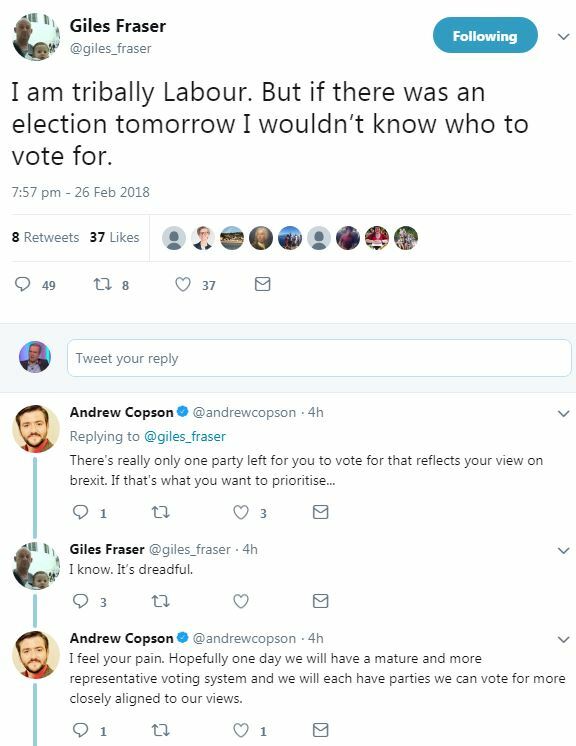 Corbyn can harp on (and on) about how much he respects the Referendum decision, thus maintaining the outward political narrative of sovereignty and independence, but his customs union would rob us of the material economic bases of sovereignty and independence, and that would indeed be a betrayal of the Brexit vote. A customs union is an economic union; an economic union demands monetary union; monetary union requires political union. These are twins; one cannot be born without the other. In consideration of the consequences for the poor, look to Greece. Those who trample on the heads of the poor and deny justice to the oppressed (Amos 2:7) will be judged. God cares for the poor, the oppressed, and the underdogs in society. He pours His wrath upon those who corrupt justice or create economic machines designed to provide more wealth for the wealthy and deprive the poor. The story of Naboth’s vineyard in 1 Kings 21 establishes that authorities are not free to pursue any policy they please or to ride roughshod over the rights of the poor. Jeremy Corbyn conspiring with wealthy elites against the poor; for the few, not the many?